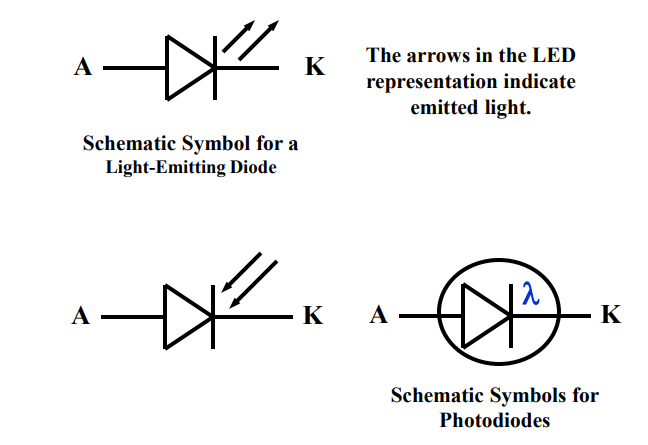 Distinguish, differentiate, compare and explain what is the Differences between Light Emitting Diode and Photodiode. Comparison and Differences. Light-Emitting Diodes LEDs, are designed with very large band gap materials, so the movement of carriers across their depletion region emits photons in the visible region. Lower bandgap LEDs emit infrared radiation, while LEDs with higher band gap energy emit visible light. Many traffic signals are now starting to use LEDs because they are extremely bright and last longer than regular bulbs for a relatively low cost. While LEDs emit light, Photodiodes are sensitive to received light. They are constructed so their PN junction can be exposed to the outside through a clear window or lens. In Photoconductive mode the saturation current increases in proportion to the intensity of the received light. This type of diode is used in CD players. In Photovoltaic mode, when the PN junction is exposed to a certain wavelength of light, the diode generates the voltage. Furthermore, it can be used as an energy source. This type of diode is used in the production of solar power. 2. In Light Emitting Diode, recombination of electrons and holes takes place at the junction and light is emitted (hv). In the photodiode, Light energy (hv) falling on the p-n junction creates an electron-hole pair which increases photocurrent.